Like everything else in life, then it is only a matter of time. hence, when your mobility scooter batteries will begin to wear out. Consequently, at first you new batteries will handle your daily trips with no problems. So, after about two years, the batteries will start to play up. As expected, they will not last you forever. Mobility batteries can work very hard. Thus, after many chargers, they will start to play up when you go up a hill. of course you be getting a flashing warning sign from your “low power light”. The easy way though is that your scooter struggles to get you home. At first this can be inermitant. Because it depends on the pressure you put on the batteries. For example if you use it on the flat or on hills. As expected, your mobility scooter could appear to run normally on the flat. But as soon as you hit a hill it could struggle. Therefore a sign that your batteries are on the way out. The batteis that are used in the demonstration,are a classic top terminal range of AGM batteries. 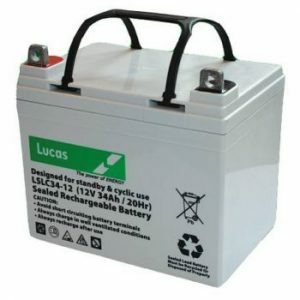 The brand that we recommend are Lucas AGM batteries. They were designed as a good cost effective reliable solution for mobility scooters and many other uses. The batteries are fitted with lead calcium plates giving them a triple benefit. For this reason, these AGM batteries provide a competitive battery solution. The Lucas product is reliable, due to their gas recombination technology. Hence these batteries are sealed and can be fitted in any position, making the batteries very versatile and maintenance free.